One of the first things I noticed about this book - and appreciated - was that it was gender neutral. Writing several step parent book reviews made it clear to me how many of the books only address one side of the step parent family, such as The Smart Stepmom, The Happy Stepmother, The Smart Stepdad and 101 Tips for the Smart Stepmother. But as in Step Parenting: 50 One-Minute Dos & Don'ts for Stepdads & Stepmoms, the advice is applicable to both parents. I also liked that it, like Step Parenting: 50 One-Minute DOs and DON'Ts, is neutral regarding religion. Several of the step parenting books we reviewed are very heavy on Christian themes. What if someone is Jewish? Agnostic? There are surely step parents of all faiths and each one should not need their own book. 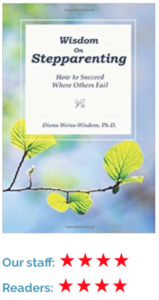 For example, I liked instead of opening each chapter with a Biblical verse, as in the many Ron L. Deal books on being a stepparent, that Dr. Weiss-Wisdom quotes people like Albert Einstein, Ghandi, or this from The Dalai Lama: "Compassion, loving kindness, altruism, and a sense of brotherhood and sisterhood are the keys to human development, not only in the future but in the present as well." Design-wise, the book was also a pleasure to read, with pages broken up with shaded text boxes, quotes and bullet points. Some of of the books reviewed were big blocks of text, page after page, which was fatiguing. But on to the content of this very good book . . . The author presents each topic in a way that helps us identify with the issue by presenting a step parent situation in story form, such as "Mark came home from school and went straight to his room after school. He refused to interact with his step sister and tried to avoid joining us for dinner. He still had so much anger over the divorce." (I'm paraphrasing there just to give you the feel of it.) I liked this aspect of the book as almost all the "real life" situations she outlined before analyzing a problem were ones that I could completely identify with, so it put me in a mindset to learn. I really enjoyed her chapter "Taking Care of Your Marriage in a Blended Family." I've read several books dedicated fully to the spousal step parent relationship (and we've reviewed one of them here - The Smart Stepfamily - and didn't review but slighly discussed in our "Not Reviewed" section - StepCoupling) and I thought I got more out of this author's one short, but well-written chapter. (But then, I'm a big fan of writers who can make their points quickly and concisely - you may prefer authors that slowly linger.) In this issue she explores boundaries as step parents and the common situation of feeling caught in the middle between spouse and child. She also shares an alarming statistic: 66% of second or third marriages fail and conflicts over children are usually a prime reason. Her chapter, "Not All Love is Equal," was also very insightful. I particularly liked her dividing two types of love: conditional love (usually stemming from a relationship/friendship) and genuine compassion. She points out how the former can be more easily replaced with feelings of anger as it is less stable. Genuine compassion, however, means having a genuine sense of harmony without conditions, not just for our families but those outside of it. Adopting this culture of kindness and love for my stepchild (for me a 13 year old step daughter) resonated with me in a way that it helped me see her as a person, not as my step daughter, who is sometimes wonderful and just as suddenly the opposite, but always deserves charitable thoughts from me. Another favorite was the chapter, "Happiness: A Scientific Approach. 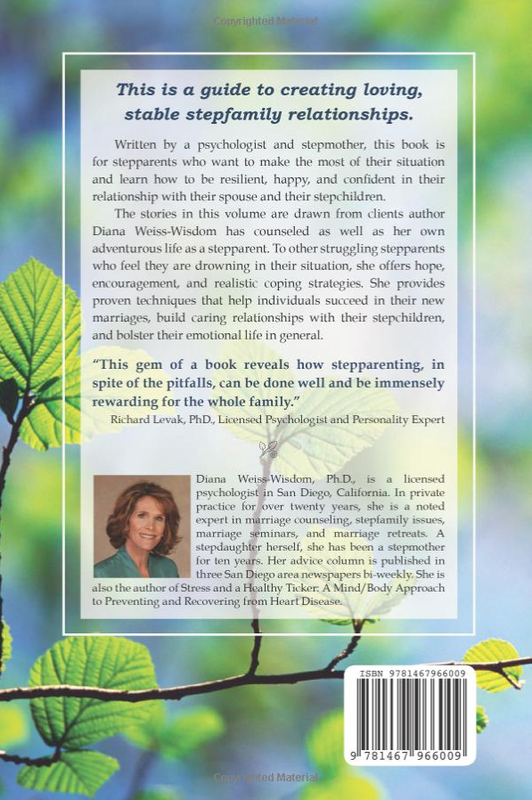 "She discusses the thinking and behavior patterns of the happiest people and talks about how to cultivate your own happiness, and how it relates to the happiness of your step children. I thought this was a very good step parent book and gave it five stars but not everyone felt the same so it totaled only four. None found, but see reviews by one other author on back of book cover.